A scalable IP-based intercom system for broadcast, theatre or commercial applications. The VCOM solution offers several user benefits over other systems: minimal dedicated hardware, near-zero installation, inclusion of roaming or remote clients and instant system reconfiguration. VCOM’s feature set includes all the facilities expected in a professional intercom and it integrates easily with existing systems. VCOM provides a highly flexible, expandable non-blocking full-duplex intercom solution for any organisation needing simple and rapid internal communications with its staff. 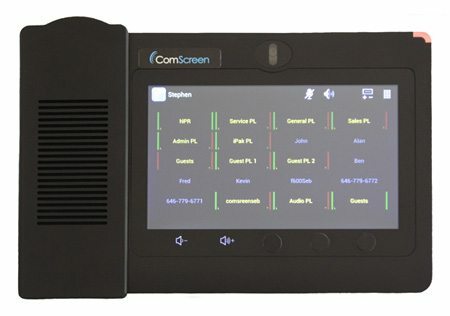 Whether across single or multiple sites, VCOM provides all the standard features expected by broadcasters and other professional intercom system users, but does so without either expensive dedicated hardware or a lengthy and costly installation process. Features include IFB (Interruptible Foldback), ISO (for private communications), Point to Point, Group Call, Party Line and Programme Audio. VCOM can be readily interfaced to existing communication networks, including intercom systems, such as Delec, two-way radios and public or private telephone systems. Operating over a LAN or WAN network, the VCOM system consists of the Virtual Matrix software application running on a standard server, and as many instances of VCOM Control Panel software – each running on any convenient PC – as required. A standard Ethernet network connects the server to the clients, and this may be the existing building IT infrastructure if wished. No special hardware is required and anyone, anywhere in the organisation who has access to a PC, can be assigned a VCOM Control Panel. Remote locations can access the intercom network just as easily as local ones; even if they are not on an existing WAN, as Internet and mobile communication networks can be utilised. With VCOM Control Panels installable on smartphones, it is a straightforward process to include staff on location. Because VCOM requires neither dedicated hardware nor infrastructure, initial system deployment is rapid and takes no longer than the time required to install the server and client software applications. Complete system reconfiguration to meet different operating requirements is equally fast, as all client panels can be redesigned or reallocated by administrator control. If staff move within the organisation, their intercom panel can move with them.